Gemma Conway – the teenage heroine. About 16 years old. Weston – Mary’s latest bargain horse. Mary Conway is obsessed with finding a bargain horse which she can train into a top eventer for her daughter Gemma to ride. This obsession has broken up her marriage and cost her so much money that she and Gemma are now living in a caravan. It is also causing trouble for Gemma as Mary doesn’t want her daughter’s schoolwork or social life to interfere with the horses’ training schedules! Mary’s latest acquisition, Weston, is a strapping horse with potential which Mary recognises. But she seems to ignore the fact that Gemma finds it almost impossible to control him. Despite problems Gemma manages to ride the horse well enough at a horse trials to get selected for the Pony Club Team. But she doesn’t feel confident in her ability to do well with the horse on a more testing course. At the same time she has met a boy called Morgan and their friendship seems to be turning into something more. The long-awaited disaster strikes as Weston proves too much for her at a pony club event and bolts out of the ring. Even then, Mary doesn’t give up and wants her daughter to try schooling him with a different bit. Gemma is at her wit’s end. She can’t seem to make her mother see that Weston is just too much for her to handle. But she is saved by an unexpected event. Lucy Bell another member of the PC team has an accident and is unable to ride for the next few moths, and her father asks Gemma if she can take over the schooling of Caraway, Lucy’ s brilliant horse and ride him in the PC events. Gemma feels guilty at what seems like a betrayal of her mother but the chance is too good to miss. She begins shooling the horse whom she finds an easy ride after Weston. She even has lessons from a private teacher whom Mr Bell had hired for Lucy and she soon finds her riding improving.There is a real chance that she will do well at the next big show. But then things begin to change. Strangely she finds herself wondering if her mother was not so wrong after all. At the end of the book she finds she has the chance to escape the life that has been dragging her down her for so long. But now she has that chance can she, indeed does she want to take it? This is in my opinion one of the author’s best books. Unlike some of her ealier works which tend to be a tad rambling, this one is tightly plotted with a nice (although not totally unexpected) twist at the end. The quality of writing in pace, dialogue and character development is excellent. Some aiuthors deteriorate after their first books. others improve with age and Gillian Baxter, like Patricia Leitch, is one of the latter. The books she wrote later in her career – the Pantomine Ponies series – are of a far superior quality to anything she wrote earlier and it is probably only because they were aimed at a much younger readership that they never quite achieved the praise they deserved. This book however combines the teenage characters and the familiar pony book settings of the earlier books with the higher standard of writing of her later works. Bargain Horses is also a highly original book in a number of ways. At the heart of its originality – and the factor which appealed most to me – was the way it managed to stand the normal pony book formula on its head. Everything we normally see in a pony book is completely reversed here. Whereas we usually have a horse-mad heroine whose parents are constantly trying to get them to do more school work and have a life outside horses, this book is the complete opposite. Gemma is the one who wants to do well at school and is prevented by her mother who feels that school gets in the way of their training schedule! Gemma thinks that she may possibly like to have a career away from horses, it is her mother who wants her to become a top eventer. Unlike most pony book heroines, Gemma feels that horses are getting in the way of other things she would like to do: such as go to parties and have a boyfriend. Another way it stands apart from the run-of-the-mill pony book is the way it handles the main adult character of Mary. Mary must be one of the most three-dimensional adults in any pony book. Sadly in this genre, the adults are often very sketchily drawn or simply caricatures, but not so in this novel.Unlike the grown-ups in many of Gillian Baxter’s earlier pony novels, Mary is a fully rounded thoroughly believable character. This may well owe something to the maturity of the writer who can now look at things from both a teenager’s and a mature adult’s perspective, whereas she was quite young when she wrote her first books. It is this search for a re-awkening of love for riding which forms much of the plot. Gemma thinks she has found it in Caraway, thinks that it is through escaping Mary that she can achieve it. But as the story progresses we find that it is not so simple. 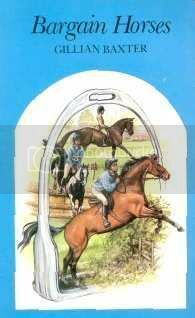 The book was published as part of J A Allens equestrian fiction series. Many of the books in this series were aimed at the older reader and this is no exception. Tthe main character Gemma is on the brink of adulthood and so some adult themes do enter the book. Although romance has been explored in many pony books, (and in patrticular Ms Baxters books which often included a romantic relationship) it is usually very muted, almost platonic. In this book – possibly because it was written for the much more sexually aware modern teenager – the relationship of Gemma and Morgan does stray into the physical. This is handled subtly and is not in any way gratuitous. However I do feel that the relationship with Morgan is one of the low points of the book. Morgan’s character is not convincing. On the one hand he is a kind sympathetic person who acts as a foil to Mary’s careless attitude to her daughter; on the other hand when he does not get his way he turns downright nasty. His character is also rather two dimensional: possibly because the two main characters are drawn so superbly, his rather sketchy character does not really appeal. Nor does the relationship have any real bearing on the plot. I feel that if it had to be included it could have been much better used as a plot device which was central to the book’s progression. If there had been more of a Morgan versus Mary tension in the story it would have worked better. But personally it feels to me to have been something ‘tacked on’ to give added appeal to modern teenagers. Certainly in my mind the book would not have suffered without it. Although seen only occaisionally the character of Lucy is far more convincing than Morgan and unlike him she is central to the plot. Not only because it is through her accident that things begin to change for Gemma, but because she acts both as a contrast to Gemma and a comparision with her. Although she is rich and priviliged she feels imprisoned and overprotected by her parents. Despite their differences both girls seem to understand and sympathise with each other. And it is through comparing her life with Lucy’s that Gemma begins to realise that she is not the only one who is dissatisfied with her life. Everyone has things she would like to change. In all good books charactrers should not remain static but should change and grow and in this story both the charaacters of Gemma and Mary do so. They begin at polar opposites but slowly each begins to see the others viewpoint..In allowing Gemma to have her chance on another’s horse without hope of her own glory Mary becomes less selfish. And at the same time Gemma begins to realise that the potential her mother has seen in Weston was there all the time and the problem may have lain more in the inadequacies of her riding than with her horse. At the same time they also start to re-dress the reversal of roles they had been living under for so long. Mary becomes more responsible and motherly and Gemma is slowly freed from her constant stress and worry and is able to act more like a ‘normal’ teenager. The end of the book re-inforces these changes. Both Mary and her daughter are willing to give things up to help the other, and in doing so they each help themselves. In summary a very thoughtful, well-written and original pony story which will particularly appeal to adult readers. Claire I am so glad you did this book, I read it a quite a few years ago and it took me ages to find it again I loved it. I loved this book to.